I have an affinity for board games. Games like Lords of Waterdeep, Pandemic, 7 Wonders, and so on. When one of the games I enjoy get a videogame adaptation, I’m usually right on top of it. Some of the best adaptations include the iOS version of Lords of Waterdeep and Puerto Rico. Others, like Ra, aren’t as well translated. One game in particular, 7 Wonders, seems to be in an eternal beta. 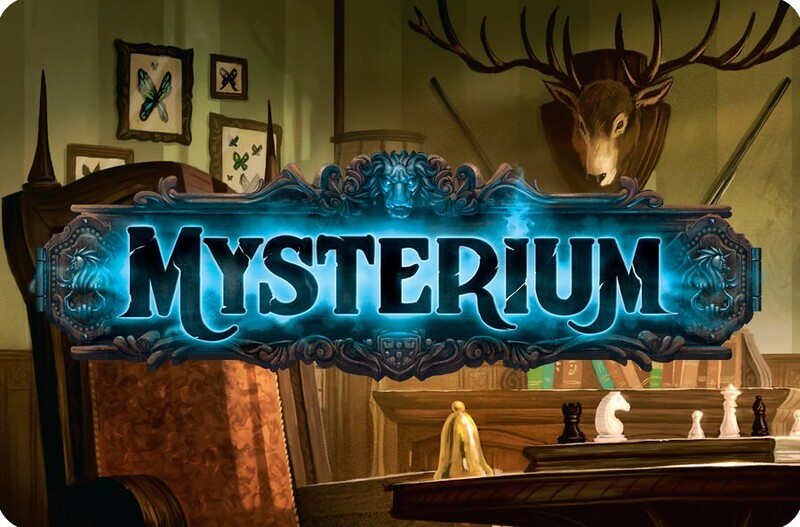 However, one of the less likely board games to get a videogame adaptation is Mysterium. The game can best be described as a cross between Clue and abstract picture game Dixit. 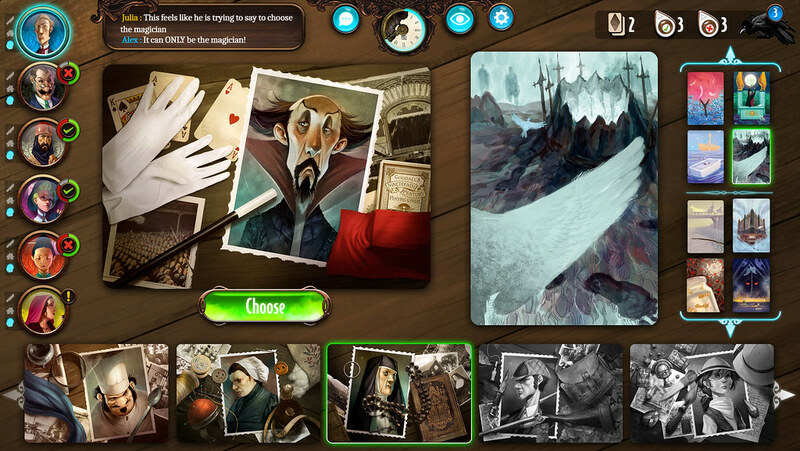 The theme of Mysterium is that one player is a murdered ghost, and the other players are psychics at a seance. The ghost sends the psychics clues related to their own murder, but the clues come in the form of wildly abstract pictures that Salvador Dali would be proud of. Using those vague clues, the psychics have six game turns to determine who killed the ghost, with what and where. The game manages to represent the board game well, which lush, moody 1920’s art deco graphics. The single player campaign is basically an extended tutorial, framed in a story where the player spends time as both a psychic and a medium channeling a ghost. The game features multiplayer modes, including a Blitz mode that promises a faster game. The game plays best with other humans, because playing with a computer requires the player to do a sort of reverse Turing Test in figuring out either what the computer ghost is trying to say or, even more difficult, figuring out how to find out what connections the AI will make. For example, putting 4 yellow cards may not influence the computer to select the yellowest option in front of them. Playing with other humans is a pleasure, as always. A co-op game, you’re not going to find hostile players. The interface is good enough to allow players to communicate with each other, advising which evidence they should vote for or against. 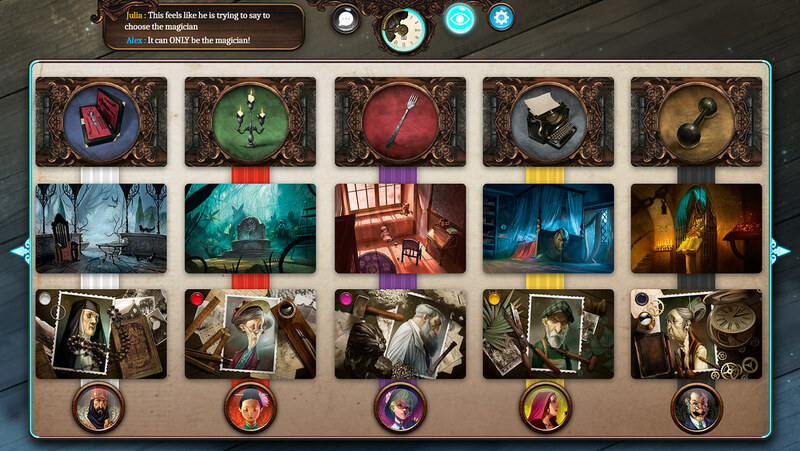 Mysterium is one of those games that never fails to present a compelling session. It’s unfortunate, then, that the population of Mysterium players is very low; matchmaking is poor, and it’s very hard to coordinate with strangers to start a game. Gamers are lucky to start four player games (1 ghost, 3 psychics), and the game really sings with far more psychics than that. Tn fact, I was never able to get a game of Blitz going. For fans of Mysterium, this game is a must-buy, but it’s advisable for players to coordinate scheduled games to avoid the dearth of online players out there. The game is currently only available on PC, iOS and Android — hopefully, word of mouth will get more players to enjoy this faithful adaptation.